Finders Keepers' 3rd volume of Ilaiyaraaja tunes offers a bounty of south subcontinental '80s electro-disco-pop. While their previous collections have homed in on his work with the "Tamil Nightingale", K.S. Chitra, and "The Electronic Pop Sound Of Kollywood 1977-1983", this one follows in the same groove as Bombay Connection's excellent 'Fire Star: Synth Pop & Electro-Funk From Tamil Films 1984-1989' or Cartilage Records' amazing 'Play That Bat Mr. Raja' compilations with 17 songs selected for their dancefloor potential. 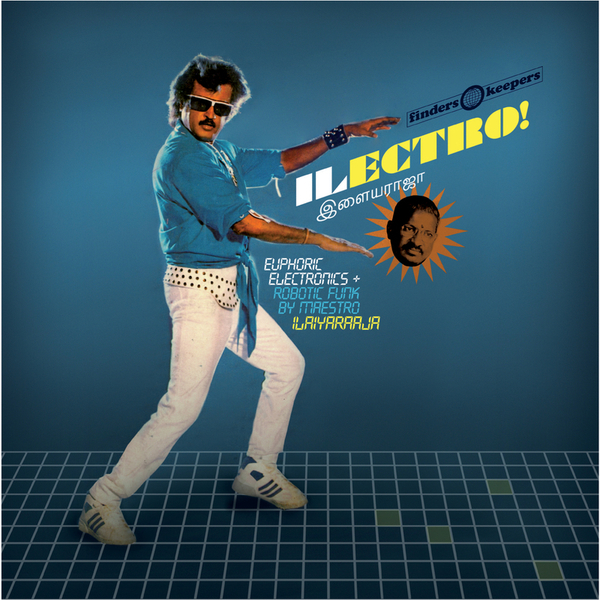 Drawn from a collection of over 4500 (and counting) songs mostly written for original soundtracks hardly known outside of his home region, 'Ilectro' follows up Raja's appearance in the Olympics opening ceremony of 2012 with a techno-coloured burst of sonic joy bound to thrill with its crammed arranegments and highly idiosyncratic application of early DX7 synths and cut-up drum machine patterns to traditional raga-style melodies and typically emoting vocals. To this extent his music can be likened with Charanjit Singh's acidic ragas or even the electronic orientations of early adopter Ilhan Mimaroglu in Turkey. Yet, ultimately, as you'll hear, this music is in a league of its own, augmenting Western pop ideas and electronics with a unique accent individual to gayaki style Carnatic music and the bombastic emotion of Kollywood cinema.